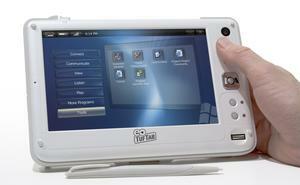 TORRANCE, CA -- (MARKET WIRE) -- March 20, 2007 --TabletKiosk™, a leader in mobile computing solutions, today announced its entrance into the rugged Tablet PC market with the introduction of the eo TufTab™ v7112XT. TabletKiosk developed the TufTab line for professionals who require a more rugged solution for their mobile computing needs including protection from rain, dust, humidity, extreme temperatures and vibration. As TabletKiosk's first Ultra-Mobile PC designed to endure physical stress and withstand harsh environmental conditions, the eo TufTab™ v7112XT is the ideal solution for field work, warehousing, mobile point of sale and data collection. Its rugged construction complements the 7" UMPC form factor when used for accessing touch screen applications, taking handwritten notes, entering data and communicating over a wireless network. The eo TufTab™ v7112XT features 802.11 b/g wireless LAN, Bluetooth® 2.0, a sunlight viewable 7" TFT LCD touch screen, SD-IO slot and a PCMCIA Type II PC card slot for maximum connectivity and expandability. For enhanced security, the eo TufTab™ v7112XT also features an integrated biometric fingerprint reader. Powered by a 1.2GHz VIA C7-M® ULV processor and preloaded with a choice of Microsoft Windows Vista™ Business, Windows® XP Tablet Edition or SUSE Linux, the eo TufTab™ v7112XT was designed to deliver a productive and efficient mobile computing experience. eo TufTab™ v7112XT will begin shipping in mid April 2007. For additional details, pricing and pre-order information, please visit www.TabletKiosk.com. TabletKiosk™ is a wholly owned subsidiary of Sand Dune Ventures Inc., a privately held technology incubator. The company produces slate style tablet PCs and UMPCs marketed through an authorized reseller channel and directly through the company website. For more information, visit www.TabletKiosk.com.